South on Main Restaurant continues to pull in enthusiastic visitors and locals alike for the Live Local music every Wednesday starting at 7:00 PM served up with the restaurants trendy New Southern menu that is truly upscale urban-country! Not to be outdone during daylight hours, The Root Café pleases with its fresh local and organic menu that keeps folks lined up daily and, in good weather, sitting at the outdoor oil-cloth covered tables. Winner of both a $25,000 Growing America: A Journey to Success grant and the much bigger $150,000 Mission Main Street Grant from Chase, Root Café still serves guests daily but a lot of big things are also starting to happen on the property. Half block from the café is Esse’s Purse Museum and Store. Don’t think this is just any old museum ... Esse is one of only five museums of its kind in the United States and it is virtually a cultural tour of the last 100+ years as seen through the accessories used by women of multiple generations. Plus, the shopping is extraordinary! Wile away a pleasant afternoon between the Corner Green Store with its Loblolly Ice Cream Shop, Moxy’s Modern Mercantile, and Sweet Home Antiques. These incredible shops are a simpatico blend of new and retro and promise a fun treasure hunt adventure. On a mild day, a quiet stroll through Bernice Sculpture Garden calms the shopping beast and then you can recover from the exhausting fun with a cup of coffee or tea and a scrumptious pastry at either Boulevard Bread or Community Bakery. 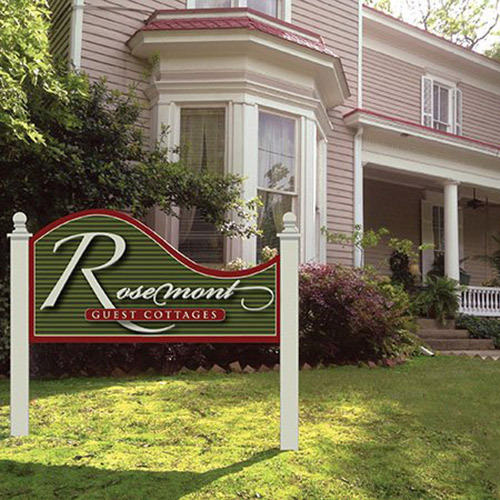 All of these attractions are within a 2-block area of each other and an easy 4-block walk from Rosemont Inn and Rosehaven Cottages. The more robust of our guests walk the additional 6 blocks or so to the Arts Center for the latest exhibit, lunch at the wonderfully sophisticated First Impressions Restaurant, and then a tour of McArthur Military Museum also located on the grounds of McArthur Park along with the Arts Center. All in all, a true urban experience in Little Rock’s most vibrant neighborhood.